Cooper is fascinated by the legendary Denini, the horse-herding cat. You see, the fluffy marmalade feline rules his barn and all the creatures therein with his velvet paw. It is one peaceable kingdom. Cooper: Honored to meet you, Mr Denini! What’s your secret to creating sucha bit o’ heaven? Denini: Respect, my little black-eyed Sweet Pea. I give respect to all creatures great & small, and it just comes right back in return. Try it sometime! Cooper: Even those massive big horses? Wow! How’d you keep them in line? Denini: Those buxom babes are really marshmallow-soft inside, and sensitive. You know, they feel a tiny fly on their sides, and swish it away with their tail. Brute force is for brutes—I just make what I want them to do (the right thing!) easy, and everything else (the wrong thing!) hard; and those big ol’ mares make the right choice every time! Use your mind, Little Grasshopper, and you’ll never have to use your claws. Cooper: Hmmmm…. I noticed you didn’t run when I offered to chase you. What’s up with that? Denini: I’ve evolved beyond the fright-flight response, silly—it’s so ancient history! When I flop down and smile, it’s pretty much impossible for you to maintain that big, bad attitude. Now, isn’t it? Meow. Cooper: When you put it that way, I can’t disagree! Is it true, that you taught the great herding Kelpie, Banner, everything she knows? Denini: Let’s just say, we shared notes. 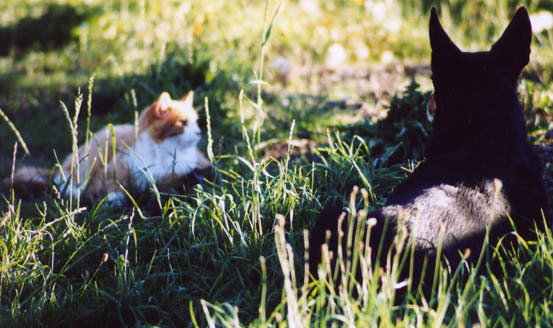 Many days, we herded horses, then rested in the tall cool grass together. Remember little Coopster, never claim all the credit, ’cause you’re always standing on the tall shoulders of those who went before! Cooper: Thanks for sharing your wisdom, Nini Beani! I’ll remember our time together forever.